Savvy Sony has spotted that TV screens are getting ever bigger and it's worried that your 85-incher might topple over and crush the beloved family cat. That's why the Sony Bravia X9 has been made wedge-shaped, making it thicker at the bottom than the top. As well as making the set sturdier, it means that Sony can shoehorn some superior speakers into it, including a two-way Long Duct Speaker that should boost the bass. The new design also "simplifies connections" thanks to its new style port replicator that "streamlines cable management without cramping your style". Unless your style is unruly cabling, in which case consider it cramped. As well as the fun new design, Sony's X9 offers 4K resolution using Sony's X-Reality Pro picture engine, a new "one-flick" on-demand interface and comes with a built-in web cam for Skype calls. Available in 79-, 65- and 55-inch models, the new TVs will be on sale from spring 2014; no word on pricing yet though. If you fancy the wedge but aren't too fussed about the Ultra HD playback, the non-4K Bravia W95 will also rock the same cheese-inspired design. 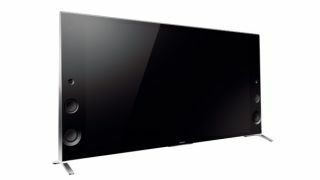 Also announced at CES 2014 were four new updates to Sony's Blu-ray player line-up, the most impressive of which is the BDP-S6200 which offers 4K upscaling, 3D playback, music enhancement and internet access. The new Blu-ray players will be released at the end of January 2014.